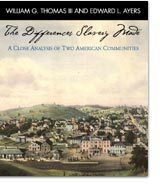 William G. Thomas III and Edward L. Ayers have a piece of digital scholarship entitled “The Differences Slavery Made: A Close Analysis of Two American Communities” that analyzes Augusta County, Virginia and Franklin County, Pennsylvania in the period just before the Civil War. While the scope of the article is to relate how slavery affected these two small communities, it contains some important analysis of the election of 1860 as well. The method follows closely that used by Ayers in his excellent book In the Presence of Mine Enemies. Analyzing primary documents from these two small towns close to the Mason-Dixon line sheds new light on previously held notions of how the buildup to the Civil War affected everyday Americans. Of particular interest in this article is the summary of Politics and the Election of 1860 and the “points of analysis” from these towns in the Campaign of 1860 and the Election of 1860. The digital format of this article makes it particularly compelling as the authors’ points about each county can be summarized briefly in a side-by-side manner, and then expanded upon by clicking the link if more information is needed. In this expanded view of the argument, there are links to all of the supporting evidence and historiography at the bottom.